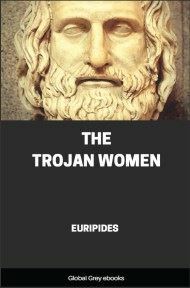 The Trojan Women, also known as Troades, is a tragedy produced in 415 BC during the Peloponnesian War. It is often considered a commentary on the capture of the Aegean island of Melos and the subsequent slaughter and subjugation of its populace by the Athenians earlier that year. The four Trojan women of the play are the same that appear in the final book of the Iliad lamenting over the corpse of Hector. 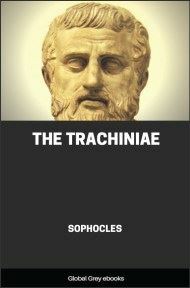 JUDGED by common standards, the Troades is far from a perfect play; it is scarcely even a good play. It is an intense study of one great situation, with little plot, little construction, little or no relief or variety. The only movement of the drama is a gradual extinguishing of all the familiar lights of human life, with, perhaps, at the end, a suggestion that in the utterness of night, when all fears of the possible worse thing are passed, there is in some sense peace and even glory. But the situation itself has at least this dramatic value, that it is different from what it seems. The consummation of a great conquest, a thing celebrated in paeans and thanksgivings, the very height of the day-dreams of the unregenerate man - it seems to be a great joy, and it is in truth a great misery. It is conquest seen when the thrill of battle is over, and nothing remains but to wait and think. We feel in the background the presence of the conquerors, sinister and disappointed phantoms; of the conquered men, after long torment, now resting in death. But the living drama for Euripides lay in the conquered women. It is from them that he has named his play and built up his scheme of parts: four figures clearly lit and heroic, the others in varying grades of characterisation, nameless and barely articulate, mere half-heard voices of an eternal sorrow. Indeed, the most usual condemnation of the play is not that it is dull, but that it is too harrowing; that scene after scene passes beyond the due limits of tragic art. There are points to be pleaded against this criticism. The very beauty of the most fearful scenes, in spite of their fearfulness, is one; the quick comfort of the lyrics is another, falling like a spell of peace when the strain is too hard to bear (cf. p. 89). But the main defence is that, like many of the greatest works of art, the Troades is something more than art. It is also prophesy, a bearing of witness. And the prophet, bound to deliver his message, walks outside the regular ways of the artist. 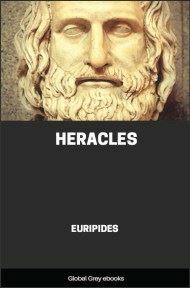 For some time before the Troades was produced, Athens, now entirely in the hands of the War Party, had been engaged in an enterprise which, though on military grounds defensible, was bitterly resented by the more humane minority, and has been selected by Thucydides as the great crucial crime of the war. She had succeeded in compelling the neutral Dorian island of Melos to take up arms against her, and after a long siege had conquered the quiet and immemorially ancient town, massacred the men and sold the women and children into slavery. Melos fell in the autumn of 416 BC. The Troades was produced in the following spring. And while the gods of the prologue were prophesying destruction at sea for the sackers of Troy, the fleet of the sackers of Melos, flushed with conquest and marked by a slight but unforgettable taint of sacrilege, was actually preparing to set sail for its fatal enterprise against Sicily. Not, of course, that we have in the Troades a case of political allusion. Far from it. 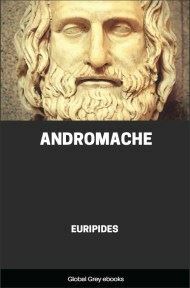 Euripides does not mean Melos when he says Troy, nor mean Alcibiades' fleet when he speaks of Agamemnon's. But he writes under the influence of a year which to him, as to Thucydides, had been filled full of indignant pity and of dire foreboding. This tragedy is perhaps, in European literature, the first great expression of the spirit of pity for mankind exalted into a moving principle; a principle which has made the most precious, and possibly the most destructive, elements of innumerable rebellions, revolutions, and martyrdoms, and of at least two great religions. Pity is a rebel passion. Its hand is against the strong, against the organised force of society, against conventional sanctions and accepted Gods. It is the Kingdom of Heaven within us fighting against the brute powers of the world; and it is apt to have those qualities of unreason, of contempt for the counting of costs and the balance of sacrifices, of recklessness, and even, in the last resort, of ruthlessness, which so often mark the paths of heavenly things and the doings of the children of light. It brings not peace, but a sword. 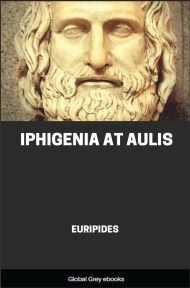 So it was with Euripides. The Troades itself has indeed almost no fierceness and singularly little thought of revenge. It is only the crying of one of the great wrongs of the world wrought into music, as it were, and made beautiful by "the most tragic of the poets." 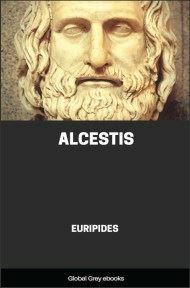 But its author lived ever after in a deepening atmosphere of strife and even hatred, down to the day when, "because almost all in Athens rejoiced at his suffering," he took his way to the remote valleys of Macedon to write the Bacchae and to die.